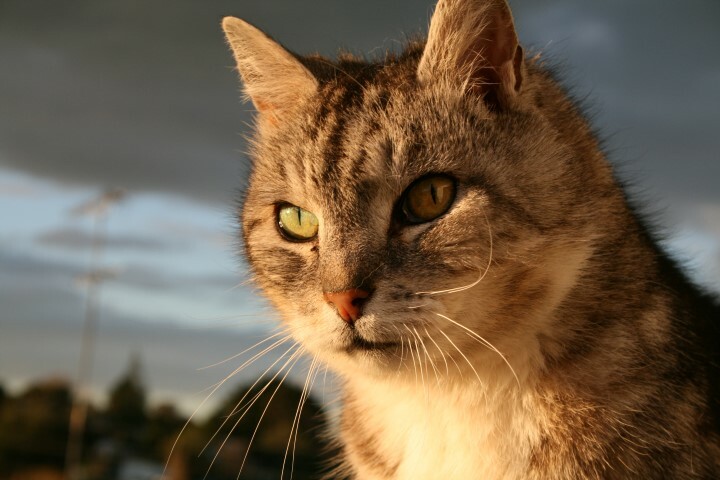 I want to tell you a dramatic story about an amazing cat – Mrs Chippy, but first let me relate my own experiences with these wonderful animals. I’ve been a cat lover for many years. Mozart, a gentle, large grey tabby, shared my life for 14 years. During that time, we had many adventures together including a year when I left him in the care of tenants while I was out of the country. They made him feel a stranger in his own home as they brought their own cat without telling me. It took a month or so for him to forgive me for this rough period in his life. Mozart ‘wrote’ two books expressing his views on a range of topics. You will see these books available at the side of this blog. After he died, I felt lost and a little depressed. 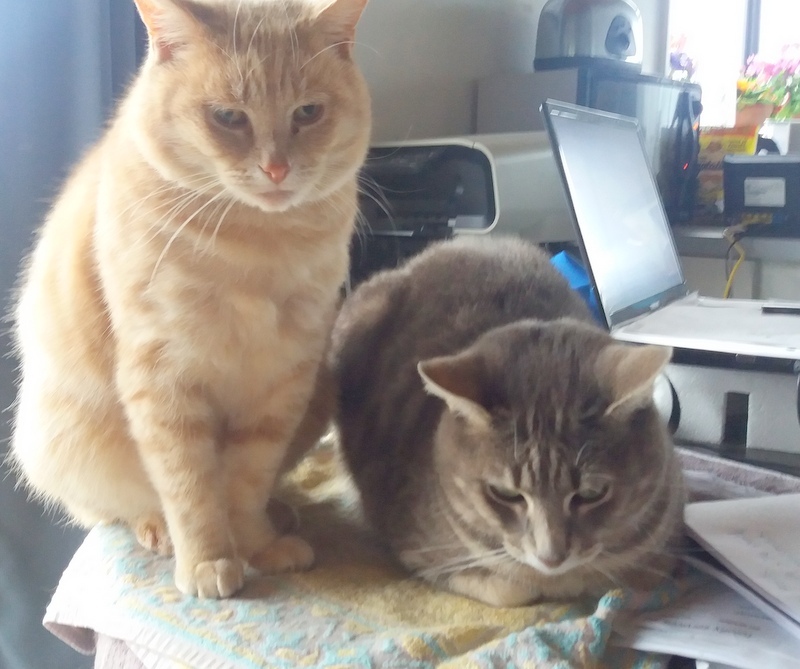 However, 6 months after his passing, two cats I had never seen before, arrived at my front door. Socrates and Plato have been with me ever since. I have no idea where they came from but it is a joy to share my life with them. They are incredibly close and go everywhere together. Plato had his tail cruelly removed at some time. (He is not a natural Manx). Socrates has a broken tail, so I have the suspicion they were both badly treated as kittens. I now shower them with the love they deserve. They return the love too. Six months ago, the neighbours behind me left and abandoned the pure black young cat they had. Needless, to say, I now have Molly Molly. She doesn’t get on that well with the boys, but they put up with her. She also deserves love and she is responding to the care I show her. She is a bit thick as she has never worked out how to use the cat flap. Even though she has seen Plato and Socrates coming and going through it and my careful instruction sessions with her, she still has not managed to use it. She tests my patience when she wants in then wants out five minutes later. On the brighter side, the exercise of getting up and down from my chair keeps me fit!! On top of my trio, a cute little cat turned up three months ago and immediately took a liking to Socrates, She wouldn’t leave him alone and to be honest, her exuberance and infectious personality, was too much for my three. She wasn’t being fed by whoever owned her, so she enthusiastically consumed the food I left out for the others. To cut a long story short, I placed a photo of her on a community notice board and within two days she was claimed by a couple who had recently lost their cat. I recently checked on her and was told she was now a much loved member of their family so I’m pleased I was able to be an agent in her future welfare. Now to the main story of this blog! Forty year old Harry McNish was the carpenter onboard the Endurance during Ernest Shackleton’s disastrous Antarctic expedition of 1914-1917. Harry boarded the ship clutching a tabby cat. It has not been recorded how or when Harry and his pet first met but they were obviously very close when they boarded the ship together. The 28 crew members soon named the little animal “Mrs Chippy”. The name came from the cockney word for a carpenter. After a month at sea, it was discovered Mrs Chippy was actually a boy but the name stuck. The little cat was amazingly agile and managed to run along the slippery inch wide railings beside the deck, even when the ship was being tossed about by the rough seas. 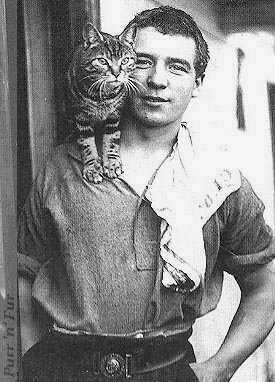 Mrs Chippy was described as ‘full of character’ and was unanimously nominated as the ship’s cat and became a popular crew member but it was Harry who really adored him. I understand how much he loved his furry friend and he must have found him a source of immense comfort on the uncomfortable ship. Mrs Chippy on the shoulder of the Endurance’s cook. Heartbroken by the loss of his beloved little friend, Harry staged a one man mutiny and his relationship with Shackleton remained strained for the rest of their time together. The sad man became withdrawn and moody and had to be forced to undertake the tasks he was asked to do. However, his skills were responsible for ultimately saving the lives of all 28 men in the expedition. Harry used his skills to raise the sides, strengthened the keel and built a deck of wood and canvas to the lifeboat “James Caird” to carry Shackleton and five men, including Harry on a 15 day, 800 mile journey across the world’s wildest sea to South Georgia in one of the most gruelling feats of survival in history. Shackleton returned to the Antarctic to collect the men he left there and the entire expedition was saved. Despite his unbelievable ordeal, Harry never forgave Shackleton for having Mrs Chippy shot. He was later denied the Polar Medal which was awarded to most of the rest of the crew. It is believed the snub was because of the way he kicked up a fuss at the time of Mrs Chippy’s shooting. 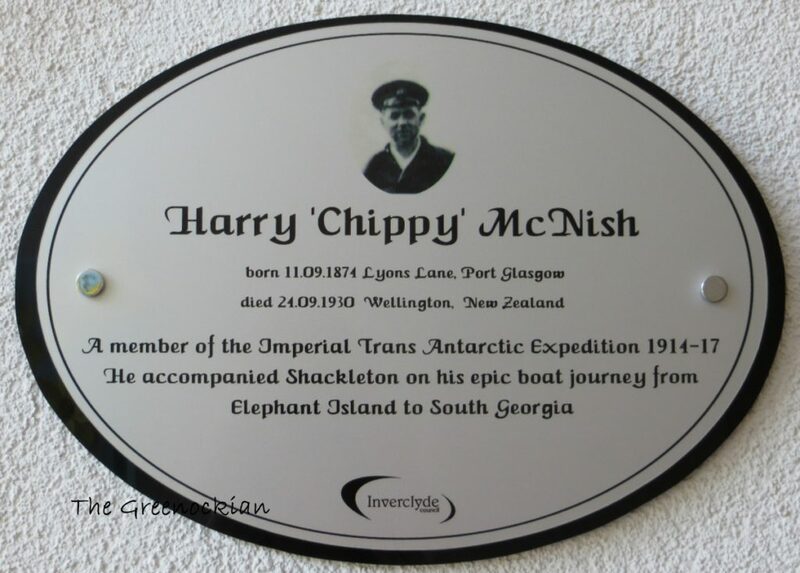 After his miserable experience on the Antarctic ice, Harry McNish returned to Britain and eventually found a job with the New Zealand Shipping Company. He made five trips to New Zealand, and in 1925, he moved to Wellington leaving his wife and all his carpentry tools behind. After an injury forced him to leave his job as a dockworker, he became destitute and slept in the wharf sheds under a tarpaulin and relied on food supplied by his fellow dockworkers until they arranged a place for him in the Ohiro Benevolent Home. 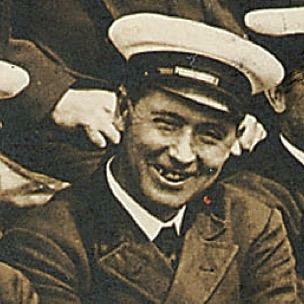 He died in Wellington Hospital on 24 September 1930 and two days later he was buried in Wellington’s Karori Cemetery. His grave remained unmarked for almost thirty years until the New Zealand Antarctic Society erected a headstone on 10 May 1959. 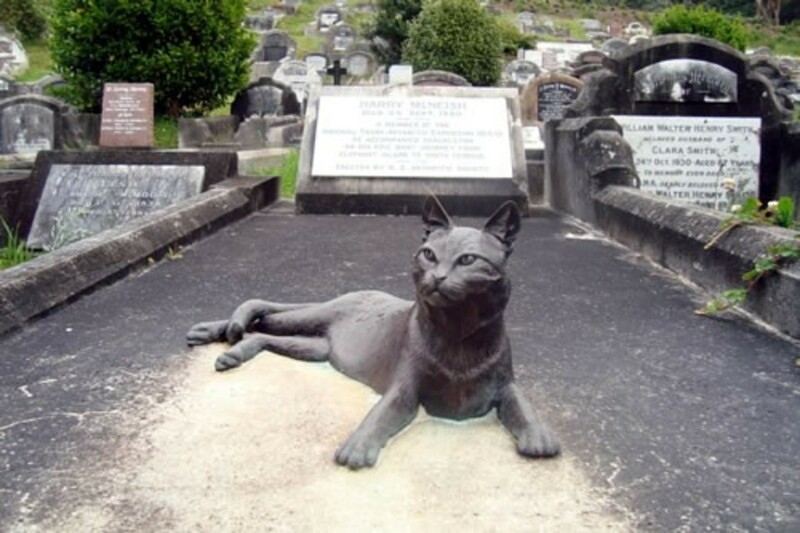 The grave was again forgotten but in 2004 it was tidied up, and to a bagpiper’s lament, a life size bronze sculpture of Mrs. Chippy was placed on his grave by the New Zealand Antarctic Society. I’m delighted that Harry and his beloved Mrs Chippy have finally been reunited in a Wellington cemetery. In February 2011 Mrs Chippy was featured on a postage stamp issued by South Georgia & the South Sandwich Islands. This 4 minute video shows the story as the Endurance was slowly destroyed in the ice. It also has images of Harry’s boat “James Caird”. What a beautiful story. Animals can certainly make a big impact on some humans that’s for sure.